Brian Williams Iraq helicopter: Soldiers' accounts fail to bring clarity. 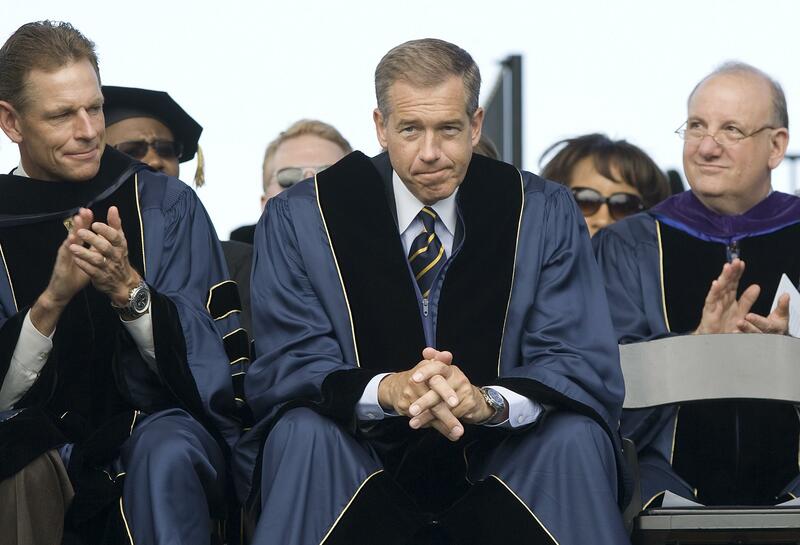 Williams receiving an honorary doctorate from George Washington University. CNN spoke to pilot Rich Krell, who gave a version of events very similar to Williams’ past claims that NBC’s crew was flying in the same group of aircraft as the helicopter that was struck by an RPG. All three of the helicopters were hit by small arms fire, Krell said, supporting Williams’ past claims about that…The three Chinooks took evasive maneuvers. Krell’s helicopter dropped off its payload, then met up with the other two about 45 minutes later. That may explain why the other crew members told Stars and Stripes that Williams arrived in the area later. Through Krell’s account would largely support Williams, the anchorman has always said that he was part of a group of four helicopters that landed “immediately” or “quickly” after taking fire, whereas Krell recalls a group of three helicopters, one of which carried Williams and took 45 minutes to land. David Luke, a flight engineer who spoke to Stars and Stripes, more directly contradicts Williams. Luke says that on the day in question his and Williams’ Chinooks were part of a three-helicopter formation that merely passed the formation that ultimately took fire. Luke said his formation of three Chinooks was carrying Williams and his NBC crew back toward Kuwait when they spotted a white Iraqi pickup truck, which stopped to watch the aircraft. They flew past quickly and continued on. Soon after, Luke’s formation passed another company of Chinooks based out of Germany known as Big Windy heading in the opposite direction toward Baghdad, he said. Luke’s Hercules Chinooks, carrying Williams and the NBC crew, soon heard over the radio that the Big Windy company they had passed came under fire from the pickup truck, he said. Luke’s and Krell’s versions seem to mutually confound the situation, but point to potential pieces of clarifying information—which company the helicopter hit by the RPG was a part of and which company Williams was with. If Williams wasn’t even with the same helicopter company as the Chinook that was hit, it’s hard to believe that any of his versions of the incident are true. If he was, then his and Krell’s versions are more plausible. And presumably this clarifying information is available in documentation kept at the time by NBC and the military.